Today marks the beginning of a very important 48 hours for a hoard of aspiring filmmakers. Olympus and the Vail Film Festival have teamed up to give contestants two days to come up with a two- to four-minute film to present before the festival’s panel. And forget the classic camcorder: Participants have been outfitted with Olympus’ E-PL2, its latest Micro Four Thirds in the PEN lineup. Before this year, contestants would use whatever device they could get their hands on, but a uniform camera lends a little twist to the competition. With identical quality at their fingertips, filmmakers will be challenged to utilize the technology, not to mention a renewed focus on story. 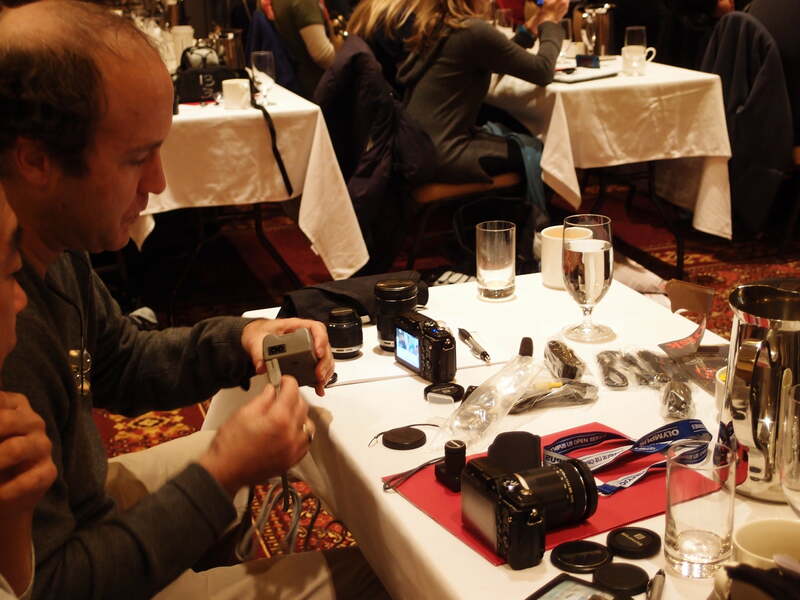 Vail Film Festival founders Scott and Sean Cross expect the high-end Micro Four Thirds devices to up the ante this year. Have any doubts that what might sound and seem like a traditional stills-cam can get the job done? Apparently, you shouldn’t. Cinematographer Kris Krosskove spoke to the E-P1’s (one of the veteran PEN models) performance this morning, telling the crowd the camera’s size and superior lens quality are what made it an ideal choice on the set of Secretariat. Krosskove said he jerry-rigged the E-P1 to a pole, and the photo revealing this duct-tape heavy solution showed the high-end camera inches away from the hooves of horses traveling 45 MPH…something a big-bodied professional camcorder would be unable to do because of size alone. At a briefing this morning, before the 48-hour countdown began, the 20 teams learned a little more about what the E-PL2’s video recording features. It records 30 frames per second and filmmakers can manually control every aspect of their shoot if they wish. Of course, there’s also the easier option of choosing Olympus’ iAuto settings. There are more regulations than just using the same camera however – which include using one of the E-PL2’s included art filters. This will add some challenge, since randomly throwing in one of the settings isn’t encouraged, and they also slow down the fps recording, something filmmakers will need to take account of. This is where the learning curve becomes important. If participants can master the functions, in-camera editing, and manual controls of the E-PL2, it will help them significantly cut down on the post-filming process. Top choice gets $5,000, a PEN lens kit, and to connect with an experienced filmmaker. The entire contest makes you think: If (largely in the case of short films) filmmakers were able to boil down the production process to existing entirely within one device, would it increase or decrease the quality of the final product? We’ll find out soon. The winning film will be screened Saturday night, and we’ll be there to fill you in on all the 48 hour-E-PL2 madness’ conclusion.